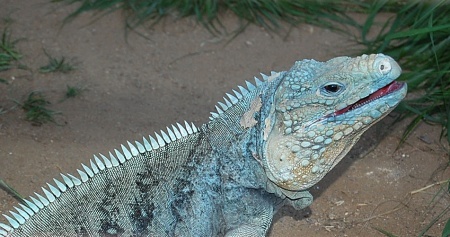 GRAND CAYMAN ROCK IGUANA (Cyclura nubila lewisi) Sadly, I must report that we are no longer working with, nor breeding Grand Cayman Blue iguanas. We have returned all of our adult breeding stock back to the ownership and control of the AZA, from where we originally acquired them almost two decades ago. I will miss working with them very much. They are one of the rarest Cyclura iguanas in the world and only a few hundred animals are believed to still exist in the wild. Please use the Contact Us link for more information.